The CRKT M16-series of pocket knives has been around for a while now but I still get questions from readers today about whether this inexpensive folding knife is a smart choice. 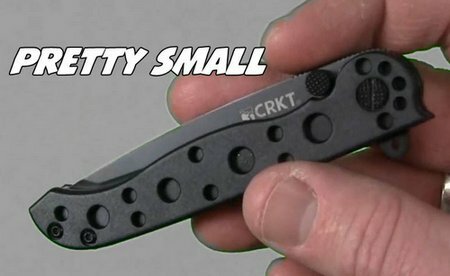 So, here’s my review of the CRKT M16-10KZ which is probably the most popular variant in the market today. Columbia River Knife & Tool (CRKT) was founded in 1994 by Rod Bremer in Tualatin, Oregon. CRKT enlists some of the most innovative custom knife makers and designers to create their knife, tool, and accessory products. They also claim to utilize some of the most advanced equipment and production technologies to manufacture their products. I often liken CRKT to Kershaw Knives – a similar US based outfit that produces a wide range of knives, many of which are affordable. I hear CRKT’s customer service is very good, as is Kershaw’s. The 10KZ is a scaled down version of the full-size M16 knife, designed by the late Kit Carson. CRKT came out with the 10KZ in response to customers asking for an “affordable work knife that we can subject to hard use without feeling guilty, and one that won’t break us up if we leave it on a job site or drop it in the river.” As such, the knife is value-priced at less than $30 from most retailers. You guessed it, made in China. CRKT's M16-10KZ is a good looking tactical but undone by too many design flaws. Given the age and popularity of the M16 series CRKT has released a vast number of variants. As usual they differ in a variety of ways but mostly by way of the blade steel, blade shape or handle material. The model I’m focusing on is the M16-10KZ. The CRKT M16-10KZ is an extremely light military-looking EDC knife weighing only 2.3 ounces. It boasts a 3” blade and the knife is only 4” closed, with an overall length of 7.125”. This is an ideal size and weight for lightweight carry, for those days when you won’t need your larger, more robust pocket knife. In your pocket, this knife feels more like a pen knife than a pocket knife, it’s so compact and lightweight. The 3” blade on the M16-10KZ has a dual hollow grind in the Tanto-style shape. The stainless steel used is the Japanese AUS-4 – and herein lies the first issue. Unfortunately AUS-4 is almost the bottom of the barrel when it comes to knife steels. AUS-4 doesn’t even make the bottom of my list of the best knife steels. I show AUS-6 on that list and AUS-8 but for me, AUS-4 isn’t worth a mention. I’ve used a couple of AUS-4 knives in my time and they needed sharpening almost daily. I notice CRKT now produces this knife with 8Cr15MoV stainless steel – a slight variant on the popular 8Cr13MoV steel which is very close in performance to AUS-8. So, if you’re set on this knife then do try and pick up the 8Cr15MoV version. Either way, the blade is 0.08” thick, well ground and this version features decently cut triple-point serrations. I tested the blade by cutting cardboard and stiff plastic packaging and noticed the blade lost its edge depressingly quickly. Oh, and there was blade play too….ugh. The handle for the M16-10KZ is made from glass filled nylon scales (Zytel) and a dual 2CR13 stainless steel liner. I do like Zytel but note it can be a little slippery. The back spacers are also glass filled nylon (FRN), and the fasteners are Torx screws. This means you will want to make sure you have a good selection of Torx drivers for tightening and maintenance of your knife, because the Torx screws do have the unfortunate habit of working loose pretty frequently. Let me also say that I hate all the holes along the handle with a passion! They’re basically havens for dirt, dust and all the crud that hides in your pocket. The CRKT M16-10KZ features CRKT’s patented AutoLAWKS automatic knife safety system. 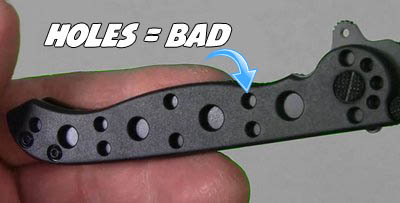 This is a great locking mechanism for the M16 full-size knife, but unfortunately I found it has some pretty serious flaws on the scaled-down M16-10KZ. The safety thumb stud is just way too small to allow you to close the knife one-handed, since you need to get your thumbnail or fingernail underneath it to release the safety. It almost seems as if the M16 full-size knife had all of its parts scaled down to the smaller size, without much consideration made for hand size of the people who would be using the knife. Several times, too, the AutoLAWKS mechanism was locked up so tight that I had to loosen the pivot screw to be able to close the knife. On the plus side, the deployment is super swift when you get the hang of it. The frame for the knife is made from 3CR13 stainless steel, and is actually pretty good. Unfortunately, to loosen the blade enough to properly deploy and close the knife results in the blade often dragging along the liner, wearing off the finish of the blade. Out of the box, the CRKT M16-10KZ is certainly a very beautiful, tactical-looking knife. Unfortunately, the finish of the knife tends to wear quickly and easily; the coating of the blade, in particular, wears off very quickly and the Torx screws come loose too easily. If you have steady hands and can work with small pieces (springs, especially), you can disassemble the knife entirely and use LocTite to keep the Torx screws in their optimum tightness positions. Be forewarned, though, that this type of modification to the knife will likely void your warranty. But hey, for a sub-$30 knife who cares. The CRKT M16-10KZ has a single-position stainless steel pocket clip, which only allows you to carry the knife right-handed with the tip down. Because of the knife’s small size, there wasn’t room for CRKT to include a lanyard hole on the knife. The pocket clip is decently sized, and has just about the perfect tightness to hold the knife in your pocket. Unfortunately, I found the black coating wears quickly off of the pocket clip, too, causing the knife to look much older and more used than it is. I’m a fan of the M16 line of knives by CRKT, and wanted badly to like the M16-10KZ. Unfortunately, the smaller knife has a number of design and manufacturing flaws that make it difficult to warm up to. The lockup is often stiffer than it needs to be, while at other times the AutoLAWKS mechanism fails completely and the knife is able to close right on your hand. The finish flakes and chips off easily, meaning you have a knife that looks years old after just a week or two of carry. With some decent competition out there such as the Kershaw Leek, Spyderco Tenacious and SOG Flash II I find it hard to recommend the CRKT M16-10KZ to anyone.